“There are no heroes…in life, the monsters win.” George R.R. Martin had it right. In life, especially in these days and times, the monsters win. 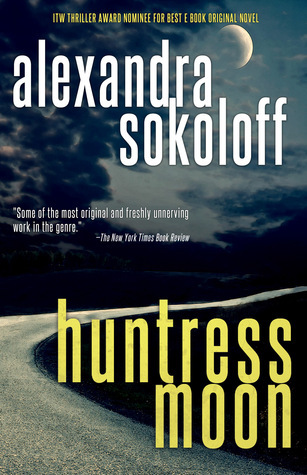 And in Thriller Award nominee for Best eBook Original Novel Huntress Moon, Alexandra Sokoloff draws the monsters in all their disturbing reality. The monsters are out there – living amongst us, drawing upon us, eating their victims, body and soul. “Put just one of these monsters out of commission – the child sellers, the serial rapists, the mutilators, the torturers – lock just one of the breathing, crawling scum away for the rest of their miserable lives, and the entire balance of the world shifts. Who wouldn’t want a license to do it? Well, that is what Matt Roarke thought from the time he was nine years old. From the time he learned of the horrors that really exist in the world. For that is the day he learned of what happened to five-year-old Cara Lindstrom and her family. Miraculously, Cara survived the slaughter of her family – a slaughter carried out by “It”, by a “Monster”, not a man. But of course, who is going to listen to a brutally traumatized five-year-old? Years later, when one of Roarke’s agents is killed in front of him in what appears to be an accident but Roarke knows is not, his attention is caught by what at first seems to be simply a witness. But in that moment, he knows she is something else, something ‘more’. And as his investigation grows, the story becomes something more than he expects. Something that will change his very soul. While some found the story ‘slow’, and of course everyone is entitled to their opinion, I found the book had an almost dreamlike quality to portions of the story – a development of characters and locations which I found ‘rich’ rather than slow. The book is very well researched and written, and beautifully paced. I don’t need to be spoon-fed story development – in fact, I am disappointed when my hand is held and I find myself with bib at throat in mystery and thriller stories. This was perfect. In a twisted turn of fate, Cara is back in Matt’s life – and the monsters, ah the monsters – human traffickers, drug lords, the darkness abounds. But hope and possibilities intermingle with the dark. And I can hardly wait to read more. The next is Blood Moon – and I am so excited to start it right away! I received this book from the publisher in exchange for a realistic review. More than a five star read – if you are interested in FBI based thrillers, I highly recommend the series. If you enjoy my reviews, please leave a “Yes” at Amazon.com – it helps me help authors! Thank you.